View of a stone bridge at Pontyeden, near Dolgellau in North Wales. Translated from the Welsh pont means bridge- this bridge crosses the lower River Mawddach which near this point is joined by the River Eden or Arran. 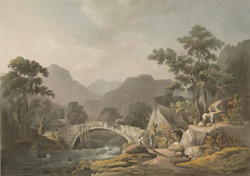 The artist of this print was Thomas Walmsley, (1763- 1806). Walmsley was an accomplished artist and follower of the picturesque school of painters, fashionable in the 19th century. Walmsley began his career as a scene painter at the Opera House in London and is known for his dramatic use of colour.